Opened in 2009, Droylsden Academy in Manchester is a contemporary, open plan teaching environment. The state-of-the-art secondary school serves 1,400 pupils, however since opening it had become apparent that its design and layout had some challenges, in a large part due to the sound pollution associated with the open-plan layout. 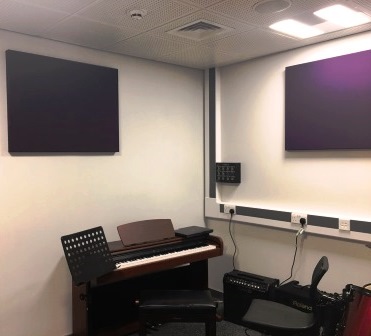 Contractors Buildmain were briefed to reconfigure a number of areas in order to minimise reverberation and improve the learning environment - and looked to CMS Danskin to identify an appropriate remedial acoustic solution. One area of the school that needed particular attention was the music room, which was too large to be conducive to effective music practice. Contractors Buildmain were briefed to reconfigure the space into four separate rooms, to provide a soundproof environment for music recital and practice. The new practice rooms were to adjoin an existing classroom and the communal corridor, so controlling reverberation was an integral part of the scheme - the architects had specified the control of sound levels up to 68dB. A complete overhaul of the existing music rooms was required - partition walls were removed and a new layout designed to incorporate the four separate practice rooms, an internal corridor and a store room. To achieve the dB rating of 68, Buildmain opted for a combination of acoustic solutions provided by CMS Danskin, including SuperPhon panels in all four rooms. In order to control reverberation in the area, Buildmain constructed the new rooms using a twin-wall method, using 15mm Soundbloc plasterboard with an acoustic matting sandwiched between the layers. The walls were then over-clad using IsoMax Acoustic Insulation Clips. To offer even higher levels of absorption, CMS Danskin recommended SuperPhon acoustic wall panels to reduce reverberation times and reflected sound. To assist with the correct specification, a CMS Danskin representative visited the site, at short notice, to assess the rooms and subsequently advised on the best options for the SuperPhon panels. A total of 20 panels were installed by direct fix to the walls of each of the four new music rooms. The 50mm thick panels were supplied in three sizes; 1200x600mm, 1000x500mm and 1000x750mm, and the colour was matched to the school’s existing interior scheme. CMS Danskin worked closely with contractors Buildmain in order to meet the very tight time frame of six weeks - the project needed to be completed within the school summer holidays, so that the rooms were ready for pupils on their return to school in September 2016.